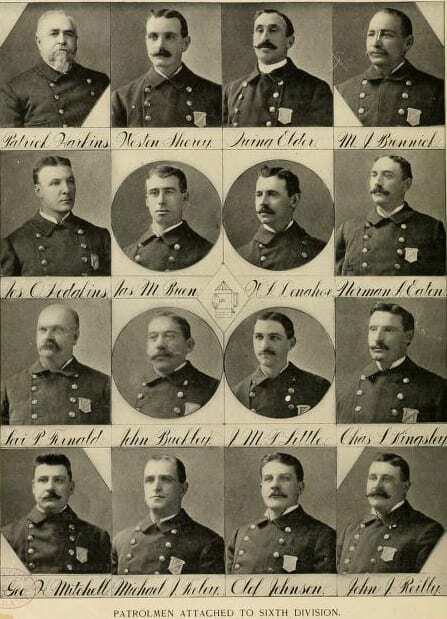 Patrolmen attached to the Sixth Division, 1901 Boston Police Department Yearbook. At least one of these officers, Joseph O. Hodgkins, was a striker. It’s that time of year! Today marks the 99th anniversary of the 1919 Boston Police Strike. We are now only one year away from the centennial of the strike, and the 1919 Boston Police Strike Project is in full swing. Volunteer researchers are hard at work documenting the men behind the strike, bringing us closer to our ultimate goal: the launch of a database of striker biographies on September 9, 2019. Last fall, students in Carolyn Goldstein’s History 620 Introduction to Public History and Public Memory graduate seminar explored strategies for commemorating the strike and for engaging public audiences in thinking about the strike and its significance from many perspectives. Their projects generated ideas to inform interpretive programs to accompany the database of striker biographies. In the spring, we introduced a free and self-paced open education course to teach participants how to perform biographical research and fill out a Bio Research Worksheet. Doing Biographical Research: The 1919 Boston Police Strike Project is open to all, even those not interested in volunteering for the project. After completing the course, students may apply to contribute to the project as volunteer researchers. To date, more than 100 people have enrolled in the course, and community volunteers have started research on over 700 of the 1142 strikers. Also this spring, Margaret Sullivan gave popular presentations about the strike at the New England Historic Genealogical Society and the Boston Public Library. Subsequent media coverage by the Boston Globe and WGBH’s Curiosity Desk helped spread the word and connect new audiences with the 1919 Boston Police Strike Project blog. Visitors to the blog can check out the newest feature, a searchable list of strikers. Browse the list to see who participated in the strike and where they lived and worked, or view a single striker’s duty card. To learn more about the project, visit the 1919 Boston Police Strike Project blog. Email bpstrike@live.umb.edu with any questions. Save the date for a commemorative centennial event on September 7, 2019 at the Central Branch of the Boston Public Library in Copley Square. This entry was posted in Announcements, Events and tagged 1919 Boston Police Strike. Bookmark the permalink.